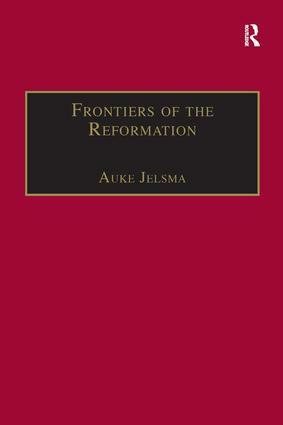 In this fascinating collection, Auke Jelsma explores the byways and outer reaches of the Reformation: groups and individuals who, in an age of confessional strife, eschewed the certainties of the established churches and sought religious truth in unconventional ways and across confessional boundaries. The author, one of the most distinguished Dutch Church historians of his generation, casts a humane and sympathetic light on forms of belief that in their own day attracted censure from the orthodox of both sides, and have been little considered in subsequent general treatments of the Reformation. Subjects include the Congregation of Windesheim and its influence on Protestantism; the role of women in the Anabaptist kingdom of MÃ¼nster; the Devil in Protestantism; the Protestant attack on popular culture; marriage and the family; the sixteenth-century reception of St John of the Cross and Protestant spirituality. Contents: Introduction; Competing concepts of Reformation; ’Reluctant rejection’: the Congregation of Windesheim and the Protestant Reformation; The Devil and Protestantism; A ’Messiah for women’: Religious commotion in North-East Switzerland, 1525-26; The king and the women: MÃ¼nster, 1534-35; Women martyrs in a revolutionary age: A comparison of books of martyrs; Why the Reformation failed; The attack of reformed Protestantism on society’s mentality in the northern Netherlands during the second half of the 16th century; ’What man and woman are meant for’: On marriage and family at the time of the Reformation; ’Believing while in darkness’: A Protestant view of St John of the Cross; The reception of John of the Cross within Protestantism; ’Without a roof over one’s head’: Stephen Gardiner (1483?-1555) and some characteristics of Protestant spirituality; Index.